Rob Merlino's Shark Tank Blog operates independently of ABC's Shark Tank reality TV show. We are not affiliated with ABC, Sony Pictures, or any other “Shark Tank entities.” Readers benefit from exclusive connections with entrepreneurs appearing on the show. We also associate with the Sharks when opportunity presents itself, so that we can offer fans the scoop on all the hot gossip. Shark Tank Blog reports on the Reality TV Hit Show Shark Tank, Investors, Entrepreneurs and Fans. 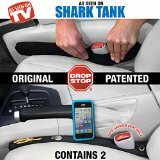 This site was started by Kirk Taylor and Rob Merlino in early 2012 to write about and report on the Shark Tank on ABC. We wanted a place where we could find a list of Shark Tank episodes, reviews of Shark Tank Products, previews of Shark Tank entrepreneurs, and interviews with Shark Tank entrepreneurs and Sharks. Rob took the site over in early 2013. Rob Merlino (Hotdogman) started blogging around seven years ago on a variety of topics including his love for the hot dog. Rob is a prolific writer published in several books, in newspapers, and on numerous blogs. The third season of Shark Tank finished, and we wanted a new, catchier name for the blog. I did research and soon after, we became SharkTankBlog.com. The new name is catchier, easier to remember and describes what we do. Thank you for visiting Shark Tank Blog and, be sure to participate in comments on the site. I am very impressed with your Shark Tank blog. It includes a great preview of upcoming episodes. Given the fact that you aren’t associated with the show, how do you get such great information in advance of the show? My blog analyzes the Shark Tank entrepreneurs and their presentations. I give Sharky Awards to the best and Shark Chum Awards to the rest. Not all Sharky Award winners receive investments from the Sharks. Pat McCarthy from Liquid Money was one such example. I predicted he would make it on his own without the Sharks. Based on your blog it sounds like my prediction came true. Thanks. I can’t reveal my secrets though! Love the show and Love your blog here!!! Great info…hopefully all entrepeneurs get what they want out of life and their dreams! Hello i have a product,that i have been trying to get on your show for the past three year,can a sister get a chance.hope to hear from you soon. Do you ever review entrepreneurs products? I absolutely love this show. It is the first time in many years I have actually sat down to watch a show over and over. The show seems to have way too many reruns. Also, it seems that often when the participants are asked what they made they will refer to years that are almost seven and eight years ago. How old is this show and why would they be referring to previous years and not current? I am totally confused. I love it when you follow your selections so that we can see their successes. Last night, Wed. 7/22 I tuned into shark tank and there was a woman who got into a bidding frenzy. fascinated but could not find out WHAT she had because it was over quickly. Can someone tell me who she was and what her product was?